Preheat the oven to 180°C/gas mark 4. Lightly butter a 20cm spring-form cake tin. Beat the butter until pale, then add the sugar and orange zest and beat until soft and creamy. Beat in the eggs, one at a time, adding a spoonful of flour between each egg. Mix the coconut into the remaining flour, then lightly fold into the egg mixture and spoon evenly into the cake tin. Place in the centre of the oven and bake for 40-50 minutes or until a skewer comes out clean. Turn out onto a cooling rack. Once the cake is cold, dissolve the icing sugar with the juice of 1 lime and spread over the top of the cake. Set aside until needed. Place the granulated sugar in a small saucepan with 100ml water. Set over a low heat and simmer gently until the sugar has dissolved and it forms a sticky syrup. Pour into a bowl and add the remaining lime juice and tequila to taste. Peel the papayas, cut in half and then scrape out their seeds. Cut each half into attractive slices and toss these in the syrup. 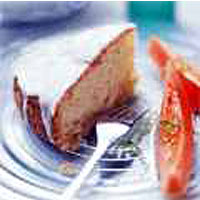 To serve, spoon some syrup over each slice of cake and accompany with some papaya. Add a dollop of crème fraîche if you wish.